Nokia Lumia 920 smartphone was launched in December 2012. The phone comes with a 4.50-inch touchscreen display with a resolution of 768x1280 pixels at a pixel density of 332 pixels per inch (ppi). Nokia Lumia 920 is powered by a 1.5GHz dual-core Qualcomm Snapdragon™ S4 processor. It comes with 1GB of RAM. As far as the cameras are concerned, the Nokia Lumia 920 on the rear packs 8.7-megapixel camera. It sports a 1.3-megapixel camera on the front for selfies. Nokia Lumia 920 based on Windows Phone 8 and packs 32GB of inbuilt storage. 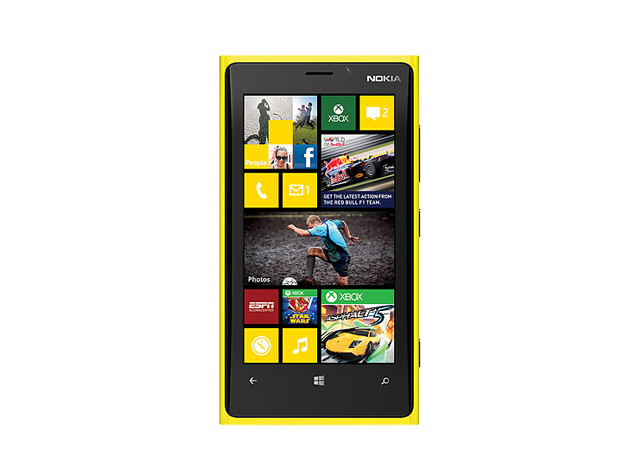 The Nokia Lumia 920 is a single SIM (GSM) smartphone that accepts a Micro-SIM card. Connectivity options on the Nokia Lumia 920 include Wi-Fi 802.11 a/b/g/n, GPS, Bluetooth v3.00, NFC, FM radio, and 3G. Sensors on the phone include accelerometer, ambient light sensor, gyroscope, proximity sensor, and compass/ magnetometer. The Nokia Lumia 920 measures 130.30 x 70.80 x 10.70mm (height x width x thickness) and weighs 185.00 grams. It was launched in Black, Gray, Red, Yellow, and White colours. As of 26th April 2019, Nokia Lumia 920 price in India starts at Rs. 8,999. Been using the lumia 920 for over a year and i become a fan of it, its been a part of daily lifestyle and a basic necessity. Best phone ever that i have been used. Still now the processing is as good as new never slowed a bit from past a year batter life is good. One the life saver while travelling. Lumia 920 is currently the flagship device from the house of Nokia. It is undoubtedly the best windows phone in the market to date....it simply beats HTC's 8X in almost each and every aspect. Thanks to the Pureview HD+ display...the display is awesome...It also has the Nokia's PureView technology in its camera. Pureview is a technology, which samples the photograph by combining multiple shots taken by camera. Hence, the main benefit of this technology is that we get a very crisp and clear image with almost zero noise level. Lumia 920 sports an 8.7 MP camera, which is almost as good as a Nokia N8's 12 MP camera due to the legendary Pureview technology. If you wanna spend in excess of 40k to get a windows phone..then this is the phone for you. Simply opt for this one...its better than a HTC 8X in its category. The touchscreen is awesome...and so is of all the windows phone devices! The social connectivity options on a windows phone device are just awesome..and a must-try. The phone sports a dual core processor, which makes sure...that our apps are running as smooth as butter. Well...Lumia 920 is powered by NFS feature too, by which we can share data on other NFC-enabled device....simply by a tap. This is the phone windows phone fanboys were waiting for so long. Well....If you could afford one and wish to spend to get a windows phone only...then the competition comes between Lumia 920 and 8X. The winner tag goes obviously to the Nokia's flagship Lumia 920! Thanks for reading my review. Nokia almost got it right! The first thing any user will notice on picking up the phone is its weight. It is bulky and heavier than competitor flagships. It is interesting that Nokia is giving low priority to weight of the devices time and time again. Move past the weight and you get to meet an awesome flagship. Build Quality: It looks elegant and clean with polycarbonate shell going around. The phone sits in your palm very comfortably with hardware buttons easily accessible. The phone is big for a 4.5 inch screen mainly due to the huge space at the bottom for touch controls. However, this should not be an issue. The screen is easily accessible with a thumb (once you get used to). The rounded edges of the screen gives a sense of completeness to the phone. There is no awkward discontinuity between screen and the rest of the body. Display : Though most of the displays released at this time used AMOLED, Nokia has gone with IPS LCD display. It boasts a PureMotion HD+ and clear black display. Though n my experience it did not feel clearblack. There is some leakage of light from dark pixels at high brightness. The colors are very vivid and feel natural. The display is also very clear in bright light. Camera: The most anticipated feature and justice done! The 8MP PureView with OIS and complemented by dual LED flash helps in getting great quality photos in almost any situation. Nokia Camera app gives freedom to control focus, exposure, shutter time etc manually and very helpful for aspiring professionals. However, you might want to get a tripod to get best shot possible. Don't want to be a pro, no issues the stock app is best at getting it right. There is lenses feature which allows shooting in various modes. Inside the phone: Nokia has held back on the hardware. It has a 1.5GHz dual core alongside a 1GB RAM. Though the specs are not high, they do not affect the speed and smoothness generally seen on flagships. This is mainly because of the less bulky Windows OS. There is no external memory slot. But you get 29 GB internal of the 32GB. Pretty decent if you ask me. It has built in wireless charging, which I felt is very useful but then I got free wireless charger. OS: Windows 8 OS might not be mature yet and has lot of drawbacks, but it feels new and different. The live tiles are simple and elegant. Nokia has enhanced the experience with its "here" suite as well as with the city lens the augmented reality app to find places nearby. The recent updates and 8.1 have addressed issues like notification center, multi-tasking, customization etc. However the platform lacks traction mainly due to apps. A user moving from other platforms will feel this dearth. There are replacements but they are just replacements. Battery life on this is good. It supports continuous (literally) chatting on whatsapp using 3G for 9 hours. Another drawback to this phone is the price. For a similar or higher config there are androids in the market. But this camera is the best this money can buy on a smartphone. Cons: 1]Problem in deleting contacts. Each time you have to click on the required contact and then automatically call will start so you got to stop call ,then go to details and then delete. 2]View contact If you click on contact name to view details,it will directly call on that contact. 3]Bluetooth defect Cannot transfer data to other devices via bluetooth. It can only be used to play music on speakers. 4]Front end camera not good. Backend camera and nokia microfocus starts giving problem after a year. Camera quality goes worst. Flash and other settings not much useful in capturing photos. No red eye correction. 5]Not as flexible work can be done in office app as compared to the work we do on PC. 6]If played games,cell gets very hot and battery gradually low . 7] You cannot download or have much exposure to different trending apps compared to android and Iphone. Pros: Only for a year ,you can capture better pics with around 8 mp camera.